Réne Gillet was a pioneering motorcycle manufacturer, who began making his own engines by 1897, which he attached to bicycle frames over the front wheel. By 1900 Gillet had settled on the ‘right’ engine location for his simple single-cylinder motors, placing them at the bottom of the frame in place of the bicycle’s crank; this was 4 years before Werner came to the same conclusion, yet Werner is erroneously credited with inventing the ‘correct’ engine location. Réne Gillet began true series production began in 1902, and by 1904 had moved to Route d’Orleans in Montrouge, just south of Paris. 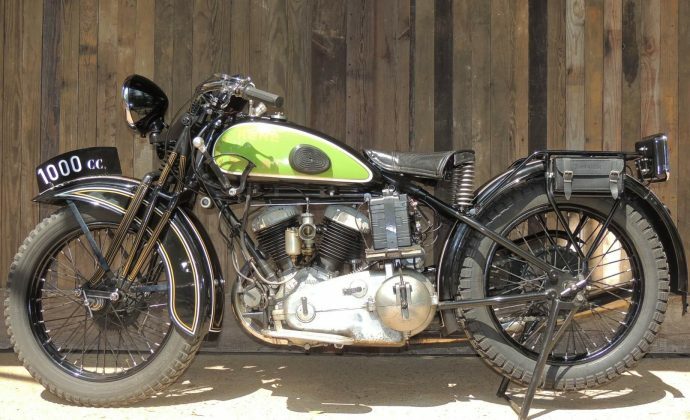 He soon built a v-twin, which became the primary focus of the company, and the engine configuration for which they’re best known. Their v-twins especially were regarded as machines of high quality, although not built for the sporting end of the market; Gillet’s aim was to build an ‘unbreakable’ tourer. As such, these robust machines immediately attracted the attention of the French police and military forces, who were regular customers. 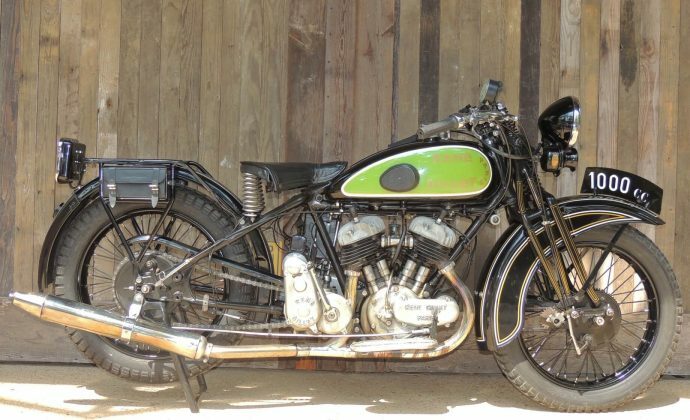 By the 1930s, all of their models used sidevalve engines; singles of 350 and 500cc, and twins of 750cc (the G) and 1000cc (the J). The largest Réne Gillet v-twins were notable for unique suspension systems, such as the combined girder-and-leading link forks on this machine, while later versions of this model used elaborate strut system for a plunger rear suspension, with no less than 5 rear frame tubes. Their wheels were interchangeable, and as mentioned, the engines gained a reputation as unburstable and solid. Réne Gillet 1000cc v-twins are highly coveted in France, as such large capacity machines are rare from any European manufacture, and the Model J is the apex of French manufacture in the late 1920s. This 1930 example of the René Gillet Model J, engine # MOTL928227134 is beautifully restored, and probably the only example currently in North America.